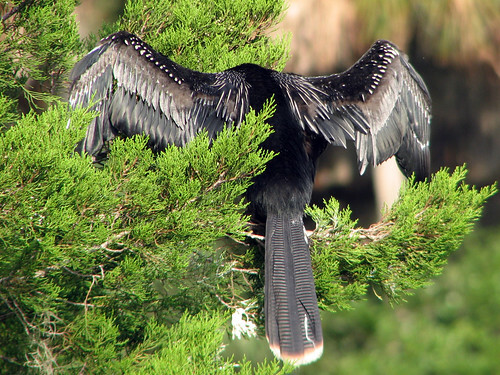 While visiting Gemini Springs earlier this week, I stopped to watch an Anhinga preening and drying itself in a tree. As I watched, I hoped it might decide to hunt so I could observe it in the water. I just love watching snake birds do their thing. But this beauty just keep on preening. 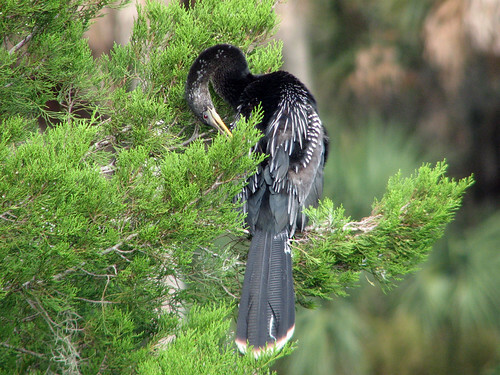 After about ten minutes, the Anhinga started awkwardly hopping downward towards the center of the tree. It seemed to be uncharacteristically clumsy and I wondered if it could be after some prey in the tree, like a frog. I lost sight of the bird just as it approached the bottom of the tree, which was over the water. It seemed to vanish behind the leaves. Or did it fall into the water? I approached the tree from the grassy shore, but I couldn’t see the bird. 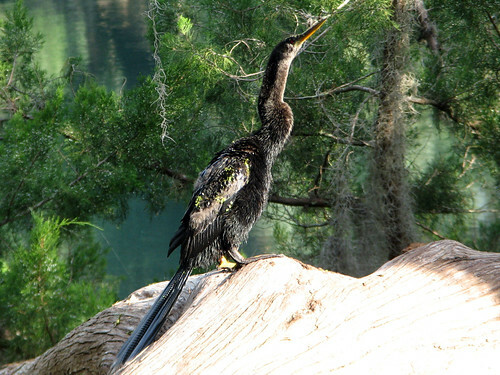 Just as I was considering stepping into the murky water to check on the fate of the Anhinga, I saw it on a lower branch, shaking water off its body. 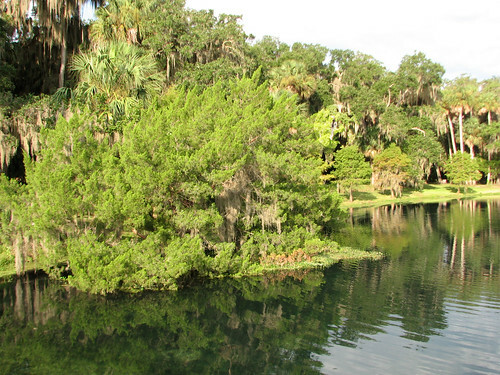 It was covered in aquatic vegetation, so I think it did get into the water, maybe not on purpose. 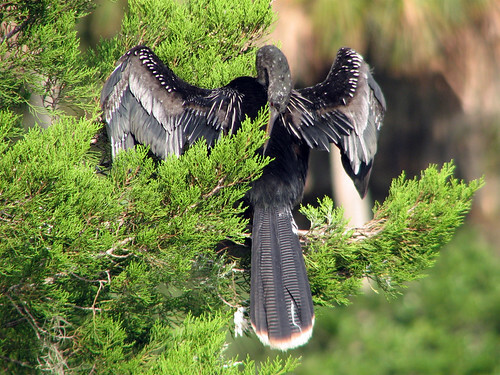 Anhingas always seem so graceful to me, so it was surprising to see this apparently clumsy individual. Of course, I don’t know what happened during the time I lost sight of the bird. Maybe it acquired prey and was satisfied with a successful hunt. From my vantage point, though, it looked like a bit of slapstick. I left the bird to another preening and drying-off session. 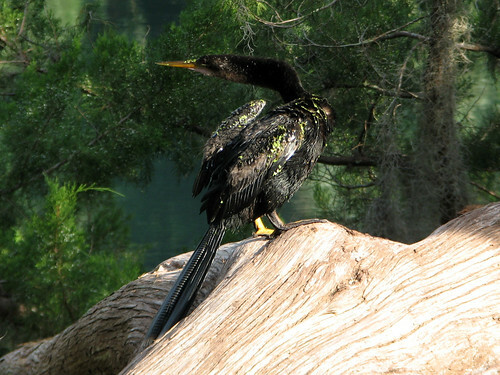 This entry was posted in Bird Photography Weekly, Florida, Gemini Springs, Volusia Birding. Bookmark the permalink. The first photo shows a magnificent area! The photos of the bird in the tree are great and you have given such an interesting description of the bird’s actions. Very nice images, Amy and interesting observation! What a great series of photos Amy! I wonder what was behind that behavior? I would think it would have to be food. 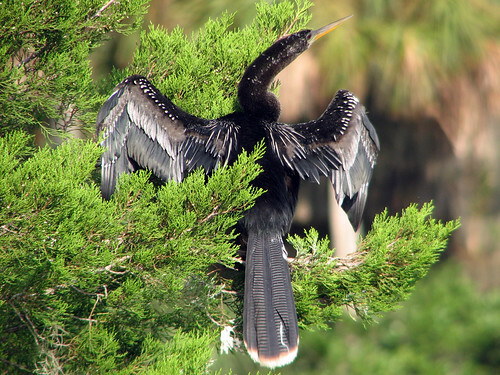 Anhingas sure are beautiful birds!